Microsoft is readying its next major release of the Windows operating system. After months of demos, early testing, beta releases, and finally announced launch plans, here's what you can expect in an upgrade. When is Windows 7 coming out? Windows 7, the next major operating system (OS) release from Microsoft after Vista, will be officially available on October 22. The first beta of the OS was released in February and a Release Candidate (RC) followed in May. The beta version will expire next week, while the RC will remain a free download until August 15. How many versions of Windows 7 will there be? Six different editions of Windows 7 will be available: OEM, Home Basic, Home Premium, Professional, Enterprise and Ultimate. You won't however see in the shops all the above edition. Marketing efforts will be concentrated only on the Home Premium and Professional editions. The other editions, including a non-Internet Explorer version for users in Europe, will be available for various markets around the world. What's in each edition of Windows 7? Microsoft said that features of all edition of Windows 7 would be stored on machines, regardless of which edition the user has purchased. Using the Windows Anytime Upgrade tool, users can unlock more features within the OS. 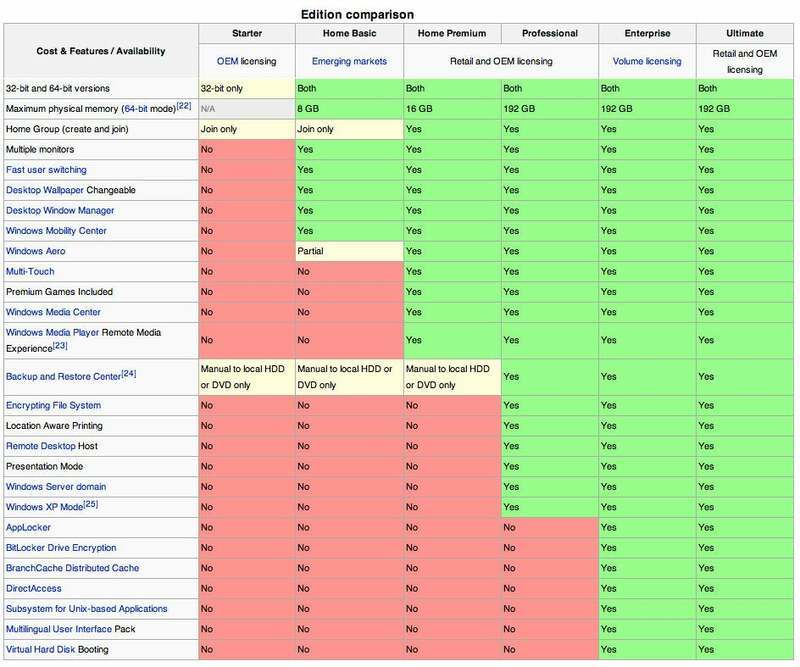 The chart below (from Wikipedia; click to enlarge it) is a fair guide on the features available in each version of Windows 7. How much will it cost me to upgrade to Windows 7? Residents in the U.S., Canada, and Japan can now pre-order an upgrade version of Windows 7 for a temporarily reduced price. The Windows 7 Home Premium Upgrade is available for $49.99 and the Professional Upgrade version is $99.99. The deal will last until July 11 in the U.S. and Canada, and only until July 5 in Japan. The number of copies available is not unlimited and Microsoft did not say how many will be available. Is there a discount on Windows 7 Ultimate/Professional Upgrade? There is no equivalent discount so far for those running Vista Ultimate and willing to upgrade to Windows 7 Ultimate. Windows 7 Ultimate Upgrade will cost $299.99 and Professional Upgrade will be $199.99. This move has already created outrage among many Vista Ultimate users. What if I don't pre-order the special deal? After the July 11 cutoff date for the special deal, a Home Premium Upgrade version will cost $119.99 and a Professional Upgrade will be $199.99. The same pricing is expected after October 22 when Windows 7 will be available to everyone. Standalone versions of Windows 7 Home Premium will cost $199.99, Professional Edition $299.99 and Ultimate Edition $319.99. HP and Lenovo will offer free Windows 7 upgrades to qualifying customers who own machines running Vista. What happens after October 22? After Windows 7 will be launched on October 22, most new machines will be shipped with the new OS.